I take photos with an Olympus digital, and my constant challenge is to minimize the exposure time. Longer exposures produce blurry pictures of a moving object, and they also make the moon, which is so bright, into a large white blob. 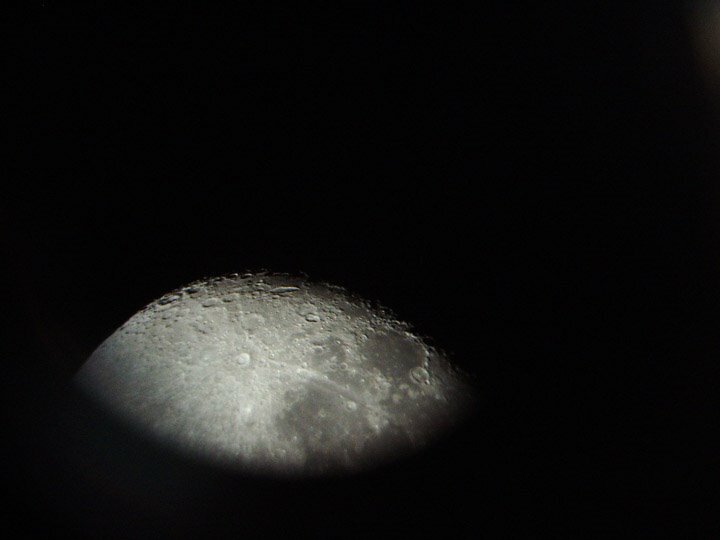 The shortest exposure I have available is the flash setting, which is fine, since it adds nothing to the brightness of the moon and only occasionally gets reflected back by the lens of the eyepiece. Often I'll use the zoom function on the camera, which allows less light to come through the aperture; and in those cases I'll turn the flash off in order to use the settings for longer exposures. A few months ago I started noticing, when photographing planets and stars, that the camera focuses differently than my own eye. The camera "sees" a different picture than I do. On digital cameras, you have the view-screen, where you can see in real time what the camera sees. 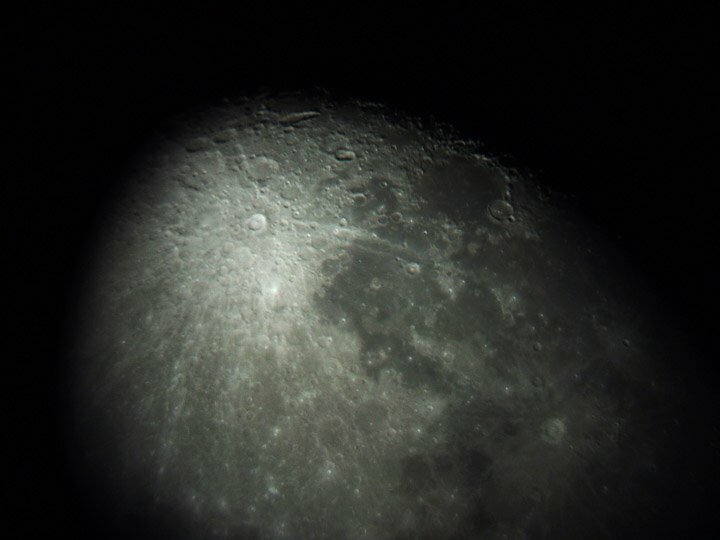 I notice that a scene which appears crystal clear to my eye if I look directly into the telescope eyepiece looks blurry in the camera's view-screen, and vice versa. The difference is significant when the eyepiece magnifies the view at a low power, for instance 30x magnification. With eyepieces that push the power up to 180x, I notice no difference. On Sunday I was photographing the moon at lower powers, with flash, no camera zoom, and at a lower exposure than the default for ordinary indoor photos. This low exposure appeared in the view-screen as a paler moon, and I found that it allowed me to freely photograph the bright areas far from the terminator (that is also possible by using higher powers or the camera zoom, both of which allow less light to come through). I started watching the view-screen of the camera when I held it up to the eyepiece, and I turned the telescope's focus knob until the camera, not my eye, saw the picture clearly. 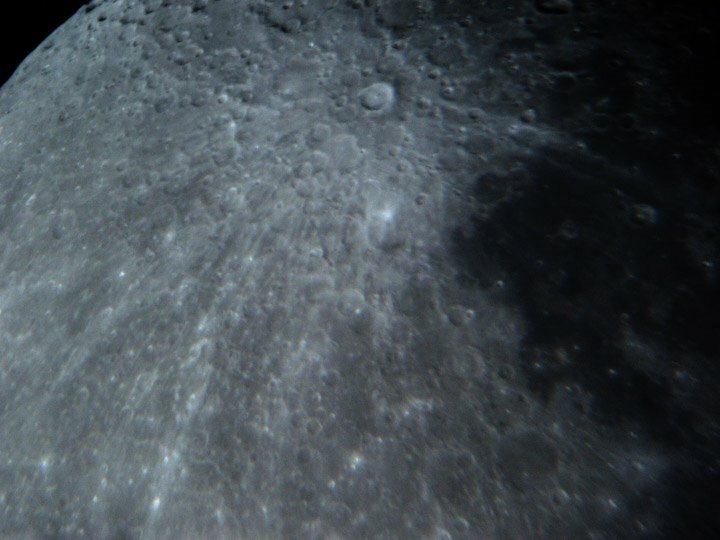 That produced the series of pictures in this post, which all prominently show off the crater Tycho and its rays. The photos appear as they do in the telescope, turned upside down by the mirrors. As always, click on the photo for a larger version. The large sea right up against the terminator is Mare Humorum. The large crater sitting on the sea's edge is Gassendi. Leading away from Tycho is a parallel set of rays that look like a tunnel or gorge -- or even a canal! When Tycho was formed by an impact about 108 million years ago, ejecta from the blast formed that pair of rays. They lead directly to a crater called Bullialdus, and if you follow that line you eventually hit Kepler, which is visible in the second photo above. At about 10:30 with relation to Tycho sits a very large crater called Clavius: you can see in this photo why I sometimes called it double-dimpled. The first large crater at about 12:30 is Longomontanus. The dark craters very far back at 11 o'clock, near the terminator, are in the region of the Leibnitz mountains. Excellent images of the Moon. Those images capture the view nicely - crisp, focused and not overexposed. 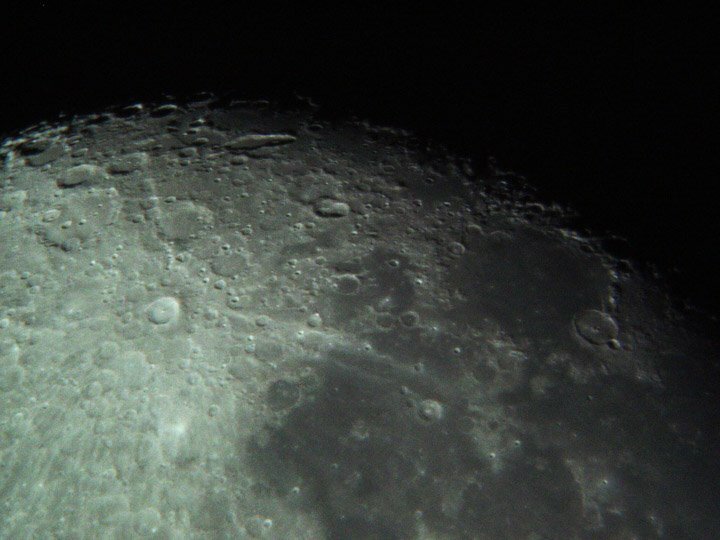 I will try taking photos of the Moon with the purpose of trying to photograph lunar occultations. Thanks for the tips - especially the one where you focus the telescope for the camera's 'vision'.